Underneath the tough exterior of the artichoke lies a delicate, tasty treat just waiting to be discovered. These unique little beauties blend harmoniously with a variety of ingredients, and are used in a variety of gourmet and everyday recipes that range from dips, spreads, salads, soups, omelettes, pastas, quiches, and casseroles. 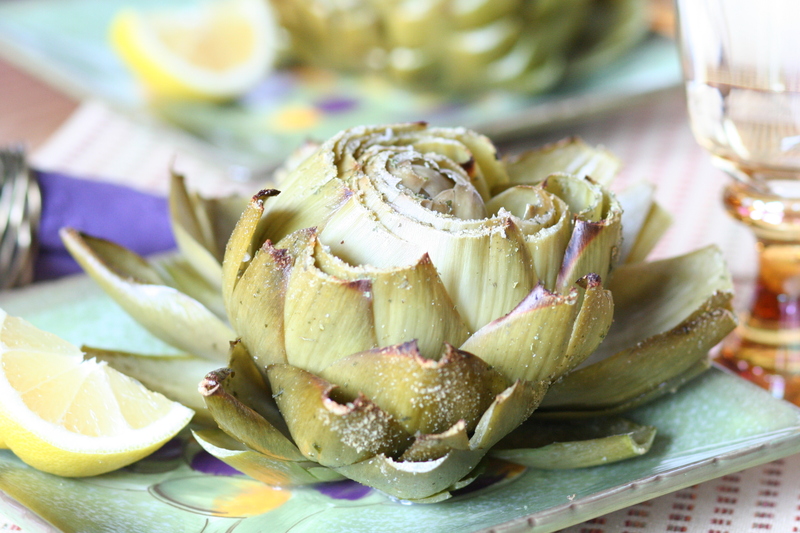 Regardless of how you finish them up, artichokes can be savored on so many levels. Happy eating! 2) Place well-drained artichokes in roasting dish, and gently pull apart leaves enough to separate. 3) Season with chervil and grey salt. Squeeze juice from half of the lemon over both artichokes. 4) Pour 1 T rice seasoning over each artichoke, top each with 1/2 T of butter. 5) Roast for 10-20 minutes until tender and browned. Serve with lemon wedge. This looks so yummy. I just bought artichokes today…good timing. Let us know how you like the recipe, Cathy!